Warning: Spoilers ahead for Game of Thrones. Stop reading now if you haven’t caught up. Game of Thrones has delivered a number of shocking deaths over the years for characters who were loved and characters who were hated. But no recent death has hit fans of the show the way that the death of Bran Stark’s protector/surrogate legs, Hodor has hit them. Episode 5 of Season 6, “The Door,” was emotional for everyone who liked Hodor, but it turns out that his death scene was almost way more brutal. 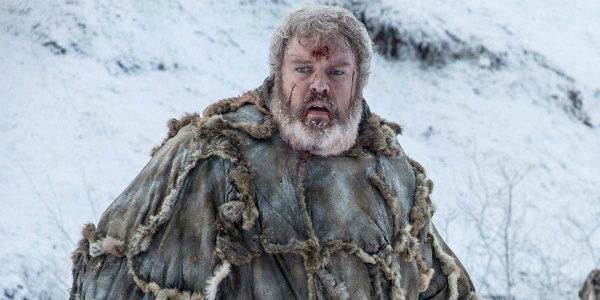 Jack Bender, who directed the episode, recently spoke about his original plans for Hodor’s last scene. I talked about it with Dave and Dan a lot. I said, ‘What the dead would be doing to Hodor would be ripping his clothes off once they got through that door. They would be ripping his flesh off. If the dead can go through wood, they’re going to be tearing Hodor apart.’ And they said something to me that really stuck. Which was ‘If it’s too horrific, we’re not going to feel the loss of Hodor.’ And that was my compass the entire time, to make us really care at the end. Director Jack Bender spoke to the Observer about how he had intended to film the scene that would have millions of Game of Thrones fans crying their eyeballs out and shaking their heads in utter sadness. Understandably, Bender’s first thought was to do the proper death-by-wight thing and show Hodor being horribly mangled and torn to death as he held the door to let Bran and Meera escape the cave. Lucky for us, show creators David Benioff and D.B. Weiss talked Bender down from the graphic murder ledge and led him into a slightly gentler direction. So, instead of watching Hodor being ripped apart, we just watch him fulfill his purpose in life: holding the door. Hodor’s death was sad for a lot of reasons. First, it was Bran’s fault for warging into present day Hodor while in a vision that included his much younger self, known as Wylis, and blowing out the poor kid’s brain. Second, this weird time loop means that once Wylis is partially incapacitated by Bran’s actions, his fate is completely sealed; his whole reason for being is now to complete that one, really big, thing for someone he doesn’t even know yet. Also? Dead Hodor, guys. Dammit. Well, I’m glad we didn’t have to watch our friend Hodor get all his skin ripped off or anything. I think Jack Bender eventually got the right message from David Benioff and D.B. Weiss; the way the scene played out did make us feel for Hodor and his sacrifice, no additional shock value was needed. You can see how Bran fares without Hodor, Sundays on HBO.